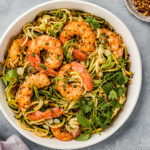 Spicy, sweet and deliciously healthy, these Spicy Thai Zucchini Noodles with Shrimp are an amazing, easy alternative to take out! Substitute chicken or tofu for shrimp optional! Make the sauce: In a small measuring cup, whisk together 2 teaspoons of the sesame oil, soy sauce, honey, oyster sauce and chili garlic sauce. Set aside. Cook the shrimp: Heat 1 tablespoon of neutral oil in a large skillet over high-heat. Add the shrimp, being careful not to crowd the pan, and cook for 1 minute undisturbed. Add the remaining 1 tablespoon of sesame oil and stir-fry, for 2-3 minutes or until slightly charred and cooked through. Season generously with salt and pepper and remove from the pan. Set aside. Reduce the heat to medium-high and return pan to heat. Add the remaining tablespoon of neutral oil to the pan, then add the shallots, garlic and crushed red pepper flakes. Season with salt and pepper. Cook until softened, about 2 minutes. Add the sauce to the pan and whisk to combine. Bring to simmer and cook for 4-5 minutes, stirring occasionally, or until sauce is reduced slightly. Add in the zucchini noodles and cook, stirring/tossing constantly to coat, for 2 minutes or until slightly softened*. Add the shrimp back to the pan and toss again to coat. To Serve: Taste and adjust for seasoning with salt and pepper. Squeeze with optional fresh lime, top with garnishes as desired and serve. Enjoy! *Serves 2-4 depending on appetite. I like to leave the tails on my shrimp for aesthetic purposes only. Feel free to remove the tails when peeling and deveining if desired! I used large (16/20 count) shrimp in this recipe. You can substitute whatever size shrimp you would like, just be sure to scale the cook time up or down accordingly in step 1 of the recipe. If shrimp aren’t your thing, or if you have a shellfish allergy, you can substitute tofu of chicken for the shrimp! Simply make sure you adjust the cook time accordingly. Do NOT use dark sesame oil when stir-frying the shrimp (or whatever protein you chose), as dark sesame oil can easily burn and taste bitter. The longer you cook the zucchini, the more they will release water, so make sure you only cook them until just softened. As well, make sure you do not salt the zucchini prior to or during cooking, as that will cause them to release moisture as well. There are a ton of notes on cooking zucchini noodles in this post.